The central premise of The Earth After Us is in discussing what traces might remain 100 million years in the future of our species and the civilisation we have built if we were to fall extinct. What anthropogenic signals might extraterrestrial palaeontologists be able discover in the strata re-exposed on the Earth’s surface? In answering this question, Jan Zalasiewicz provides an engaging and broad sweep of the science of geology, different signals preserved in the rocks, and the important inferences that can be drawn from them. Much of the book is of direct importance to planetary sciences and the study of signatures life itself can leave imprinted in the fabric of a world. 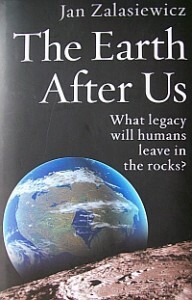 Topics include climate cycles driven by extraterrestrial influences like the forcing of Earth’s axis and orbit by our sibling planets (such as the recent pulse of ice-ages and interglacials), the dating of ancient strata by radiometric analysis of zircon crystals, and how the relics of different organisms are used to accurately date rocks from the past half-billion years. Major transitions in the geology of the Earth are covered, including the development of photosynthesis and the oxidation of the planet, and the Cambrian explosion. The highly novel seam running through this book, however, is Zalasiewicz’s exploration of how humanity might leave its legacy in the rocks. Over a hundred million year timescale, mountain-leveling erosion, sea-level change, and even the conveyor belt of tectonic plate subduction will have ensured that the surface of the Earth has been scraped clean of any sign of human activity, and the atmosphere and oceans will have long-since be cleansed of our pollution. So what records might the planet keep of our empires? Zalasiewicz explains how the first noticeable mark humanity left on the planet was the sudden disappearance of many large mammal species, around 10,000 years ago, as we spread around the world and hunted other animals to extinction. Shortly after this we developed agriculture, deforested vast areas, and replaced native plants with monocultures of a very limited number of grass-related crop species. But perhaps humanity’s greatest legacy in the fossil record will be our dirty fingerprints left in the composition of the atmosphere. As a species we have with single-minded determination sucked several hundred million years worth of accumulated carbon out of the ground and pumped it all into the atmosphere in just over a century. Rising carbon dioxide levels since the Industrial Revolution and the global warming thus caused will not only leave their calling card in geological records of the changing climate, but also the acidification of the oceans and stunting of limestone platforms built by growing coral reefs. In addition to these global signals of humanity’s tampering with the environment, the Earth’s geological processes may even save tell-tale signs of our modern cities and technology. Discovering the signatures of urbanisation after a hundred million years would be no simple exercise. No corroded cities would remain hidden amongst dense jungle, like the lost Mayan civilisation of merely a few hundred of years ago. The only hope for preservation of our constructive achievements over deep-time lies with burial, fossilisation, and subsequent re-exposure of the human strata by local crustal up-shifts. Zalasiewicz explains that cities located on down-going tectonic escalators, such as New Orleans or Shanghai, have the best chance of rapid inundation and preservation beneath thick sediment. Ironically, our reckless modification of the climate offers the most promising possibility for long-term storage of relics of our civilisation: sea level change may rapidly drown low-lying cities and so begin the preservation process. Ensuing compression as the city level is steadily buried and fossilisation ought to create a distinctive ‘Urban Stratum’, sandwiched between rock layers lying in our past and future. But the most clearly preserved remnants of our civilisation will lie beyond the Earth: our discarded hardware littering the Sea of Tranquility and four other landing sites on the timeless surface of the Moon. Zalasiewicz has a very readable style, but the central story could probably have been told in a book half the length.